Barcelona has ended their pursuit of youngster Matthijs de Ligt after showing interest on the defender who has 2 goals and 1 assist in 16 matches of Eredivisie this season.He has become a top transfer target with the likes of Bayern Munich, Juventus and Barcelona all showing their significant interest. However, it now appears as though De Ligt will not be making the trip over to Spain and will instead be heading elsewhere when he eventually leaves Ajax. 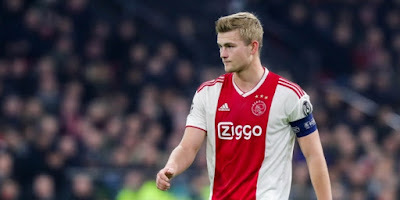 According to Ajax, Barcelona have conceded that De Ligt is highly unlikely to make the move to Barcelona and can end up at Bayern Munich or at Juventus in Turin. They also went on to add that they tried as hard as they could to make the deal a success and worked on the subject to the point that they can not do anything else. Barcelona's original plan was to make a double sweep for De Ligt and his teammate Frankie De Jong, who is also looking for a move in January or at the end of the season. A report from Mundro suggested that De Ligt's agent is intending for an auction for the 19-year-old. For this reason, Barcelona are only in pursuit of De Jong, despite previous reports suggesting that Ajax would only be willing to sell De Ligt and de Jong as a duo. Barcelona has shown significant interest in defenders as they have already conceded 19 goals in 17 matches with poor performance from Lenglet who has replaced Samuel Umtiti for Knee Injury whose expected return from injury is on Early April 2019. Barcelona has also agreed on a loan Transfer of Colombian Centre Back ,Jeison Murillo from Valencia with an option to buy for EURO 25 Million at the end of the season showing in a desperate need of a centre-back due to niggling knee concerns but spreading concerns among fans is it a good picking even though they were linked with Chelsea's Andres Christensen. Injuries to Umtiti and Vermaelen have rubbed salt into the wounds and led Barcelona to look for a quality centre-back eventually landing the Colombian. What Barcelona need is a great passer and a consistent performer free from Injuries who knows the league inside and out. Short term loan signings aren't new to Barcelona: The Loan Move for Edgar Davids was a game changer, but will the same happen with Murillo?